Milling machines cover a wide spectrum of cost and functionality. While some professional milling machines reach 5 digits in price, this is obviously out of reach for many home hobby and semi-professional users. To bridge the gap, there is the mini mill. Cost effective and ideal for smaller workshops, if you buy correctly you can have a great tool that will adequately take care of most small milling tasks. 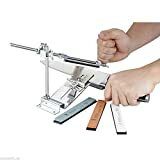 So what is the best mini mill on the market today? That’s exactly what we will dive right into here. You can view our top 5 picks in the table below. For our comprehensive mini mill buyer’s guide plus full product reviews, keep on reading. What is a mini mill? 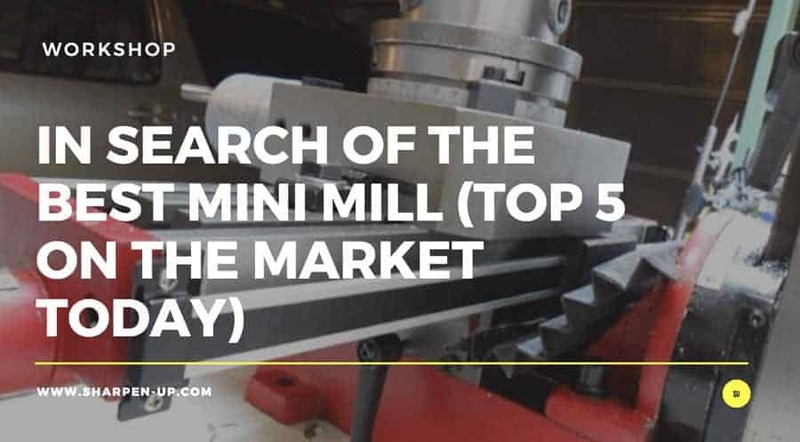 Because a range of tools can be classed as milling machines, it is important to clarify exactly what we are talking about when we say ‘Mini Mill’.The mini mills reviewed in this article can be classed as engineering mills. They are ideal for smaller workshops (they are freestanding or benchtop in configuration) and are designed to make or modify components from metal, wood and modern composites.Mini mill costs vary too. 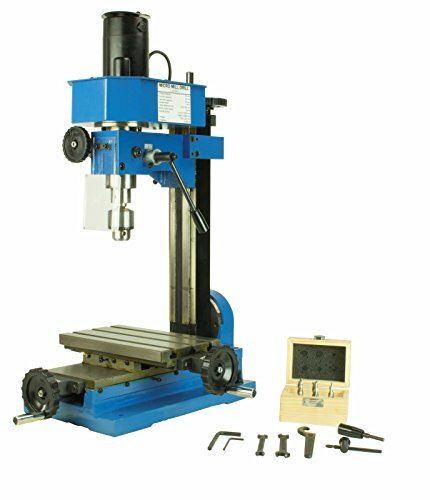 At the lower budget end you can find small drilling / milling machines available for under $1,000. 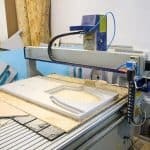 However, accuracy and features are often compromised at this price range.The mid range and above priced mini mills (between $2,000 and $5,000) would not look out of place in a professional machine shop, and provide excellent power, features and accuracy for the hobbyist and home engineer.In this article we have excluded the top-end equipment. For a fully-fledged milling machine it is easy to spend upwards of $20,000. However, for obvious reasons, these are better suited to full-time engineering shops, rather than home or semi-pro use. Before we head on to our top 5 best mini mill reviews, let’s clear up a few main points on how a milling machine works.First off, mill machines come is two main varieties: vertical and horizontal.Mini-mills are generally vertical in design. 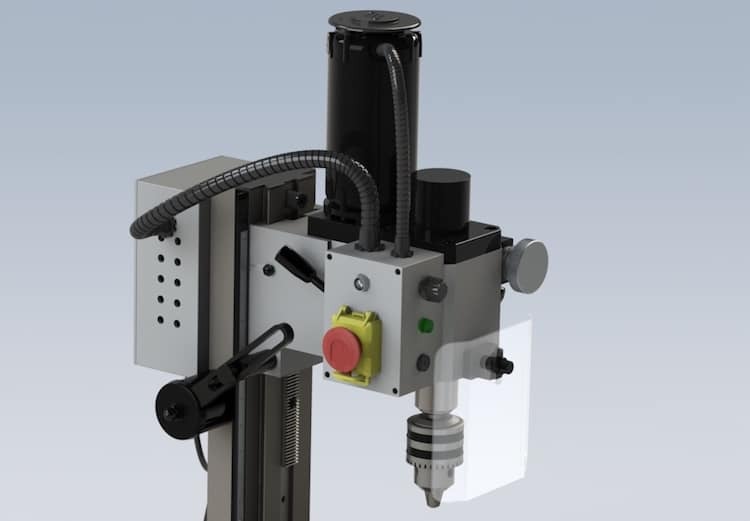 This means that the axis of the spindle (i.e the rotating shaft in which the cutting tools are housed) is vertical in orientation.One can picture a vertical mill much like a heavy-duty drill press that has a worktable beneath the spindle. This table can be moved side-to-side and front-to-back with extreme precision.Horizontal mills use a spindle that is horizontally aligned. However, due to the fact mini mills do not opt for this configuration, we will not discuss them further here. 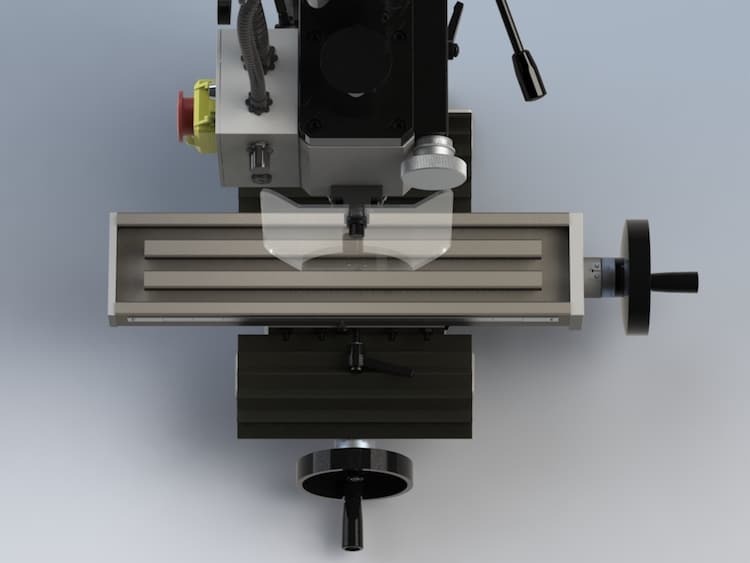 The mill spindle is mounted in precision bearings, within the head of the machine.An adaptor mates with the tapered socket of the spindle, while holding the end-mill tightly in place. This setup is centred accurately onto the spindle axis.The important factor here is the precision control allowed by the user. A good mini-mill will allow for coarse and fine movement control of the head over the vertical axis.Once the operator has have found the desired position it is locked in place in preparation for the cut. The more control you have, the better the finished results. The mill table is mounted below the spindle while being precisely perpendicular to it.The ability to manipulate the table position with precision is just as important as being able to move the head accurately.The mini mill allows the operator to move the table front-to-back and left/right relative to the base of the mill.On a good mini-mill, sturdy hand-wheels will control this movement up to a precision of .001 inch on either axis.You should also look for a table that is ground to form a flat and even surface, while also containing slots. This allows for mounting bolts to be inserted so that work materials can be clamped into place. While the amount of horsepower a mini mill packs under the hood, will indicate the capabilities of the tool, you still need the machine to be of robust design to be able to handle tougher / larger materials.An obvious view point when buying a mini mill, is to opt for the most powerful model you can afford. 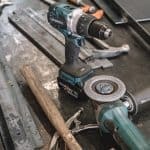 This will help ensure you and your demands do not outstrip the capability of the machine.As far as construction goes, take care to ensure that the platform and table are as solid in design as possible. 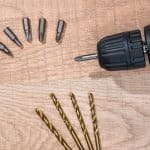 Torque is another important factor you should consider when buying the best mini mill.The more torque and down force your machine can muster, the better. This is normally obtained through buying a model with variable speed application.Gear drives will help increase torque by giving you the ability to vary the rpms. (For example, a low gear of 500rpm will have 4 x the amount of torque as a high gear at 2000 rpm. )Multiple pully belt drive options will also allow you to adjust the ratio in order to impact the output rpms. Beyond the HP specification, you might also want to consider a few other variables too.When searching for the best mini mill for you, take a look a the overall speed range, the worktable surface area, the depth the spindle is able to travel along with the distance between the head and the table.Generally speaking, the higher the number, the more capable the machine will be. Mini mill manufactures will add different features depending on the price point they are trying to reach.While your budget will impact the amount of extra features you should expect to have, design additions such belt-free speed control, coolant pumps to keep everything working at the right temperature, powered assisted tables for easier manipulation, as well as simple add ons such as built in lighting, all amount to a machine that will be more enjoyable to use. Finally we have the variable of price. At the end of the day, how deep is your wallet, and how much are you willing to invest?If you are in the market for a top grade mini mill that will provide years of accurate production, you will naturally have to spend more.If you require only a simple mini-mill for occasional work, you may be able to opt for a lower priced model. However the trade off in accuracy, can sometimes make the costs saving redundant. The quality of the work is compromised as a result.The simplest rule of the thumb is to go for the best mini mill you can afford. The Jet JMD-18 350018 gets our top pick milling machine because of the balance of high performance, excellent control and overall affordability.The design of the machine allows the operator to work on bigger jobs, without the necessary outlay you would normally have to conduct on a fully fledged professional engineering mill. Under the hood, Jet have opted for a robust and powerful 2 horsepower, 230-volt motor working on a 1 phase system.A huge plus point is the sheer range of the variable speeds the machine can operate on. 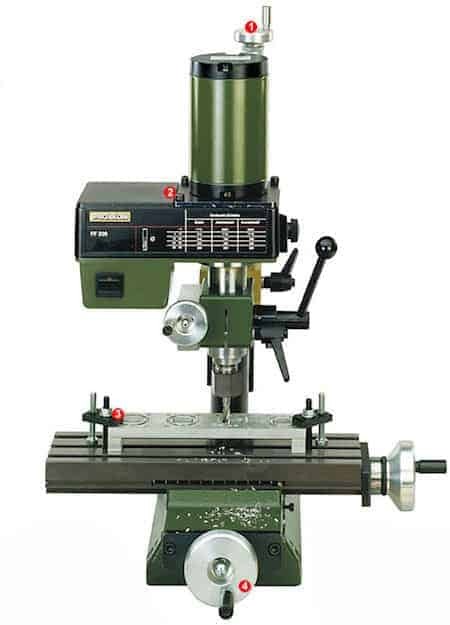 A total of 12 spindle speeds from 15 to 3,000 RPM are available.A hinged belt cover design encases the motor resulting in faster speed changing.To facilitate a wider range of possible applications, Jet have also provided an extra large, 9.5 x 31.75 inch work table.This extra space allows for larger scale projects over a standard sized mini mill. (Note: the stand as pictured in the image is sold separately from the main JMD-18 mill machine. )There’s been no scrimping on overall design quality or materials used either.The JMD-18 utilises a strong one-piece cast iron column structure, meaning heavier materials can be milled with this machine without undue stress occurring.Furthermore, heavy-duty, tapered roller bearings support the spindle. The end result is greater overall tolerance combined with increased accuracy and drilling depth.Precision control is what the Jet JMD-18 is all about. The machine is easy to operate because of its user-friendly features.Small touches such as the satin finished dials, the positive quick-stop knob and easy-to-read internal depth gauge, all allow for greater user control.The manufacturers have also built in a 360-degree swivelling head system. This provides even greater versatility while helping ensure you get the quality results you need.To make sure none of your work goes wayward through lack of visibility, the Jet also has a built in worklamp for added illumination when required.To top it all off, Jet have also backed the JMD-18 with a healthy two year warranty. 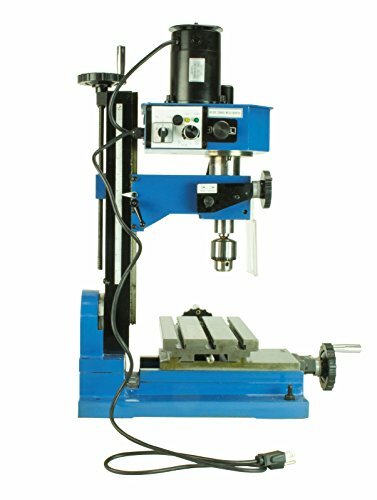 JMD-18 Mill Drill Machine, one worklamp, adjustable carbide facemill, drill press angle vise, 1/2-inch drill chuck, chuck arbor, and draw bar. One small point that has been raised by a user is the fact the machine comes wired for 110 volts rather than 230. This is easily changed however. The Jet JMD-18 is a top notch milling machine priced to appeal to home hobbyists and semi pro enginners.The features, the power and the accuracy make for an excellent machine that will last you for many years to come. In our opinion, it is the best mini mill on the market today. The Grizzly G0704 is another great mill machine that has a deserving place in our top 5 round up.The ever reliable Grizzly have managed to pack in some excellent features, some of which you would expect to find on a lot larger and higher priced mills.As a lower priced option when compared to the top pick Jet, the motor is less powerful in comparison. The G0704 offers a 1 HP, 110V, 12A, (single-phase) motor under the hood, with a variable Spindle Speed of 50–2250 RPM.A great feature that you would not expect on a mill within the price range is the R8 spindle with digital read out. This really does amount to greater control with all important ease.Grizzly have designed the unit to offer 2 feet of spindle travel along with a maximum 11 feet head travel. Furthermore, the head has the ability to tilt 90 degrees left/right.Table space is adequate too, with dimensions coming in at 7-1/16 inches x 26-5/8 inches. Built using a precision-ground cast iron construction the unit is very robust indeed.Other features include a safety shut off switch, forward/reverse switch, fine feed head control and a 2-speed gearbox.To top it all off, Grizzly throw in the very sturdy stand as shown in the pictures. 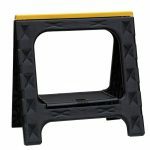 (Total stand footprint is 15-3/4″ x 16-1/2″, foor-to-table height: 37-1/2″ – ideal for the home workshop). Large table dimensions: 7-1/16 inches x 26-5/8 inches. While lower priced than the Jet, the G0704 only packs half the amount of power and does not have features such as the 360 degree swivel head. 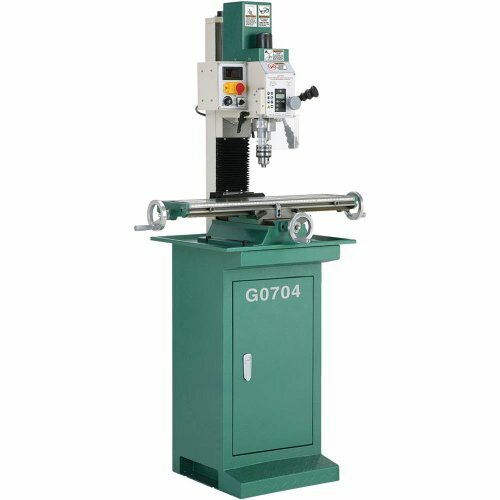 The Grizzly G0704 is an excellent mill machine for the price. If your budget cannot stretch to the power and size of the Jet, this represents a more than adequate option that will satisfy the needs of most home workshops. The Shop Fox M1111 is a great tool that offers a lot of functionality all in one package.The manufacturers have opted for a 1hp 220v (110v operation) brushless DC motor alongside a range of technical features to make your milling work as painless as possible.Let’s take a closer look at what you are getting for your money.The 1-horsepower motor features a push-button speed control that deliver variable speeds between 100 and 1,750 revolutions per minute (RPM). While not the same range as the Jet or the Grizzly, many will find this adequate speed control overall. The 6-1/4 inches x 21-5/8 inches surface ground milling table has been precision-ground from cast iron. Travel range is good at 5-3/4 by 15-1/2 inches, and is operated by a hand wheel.As you would expect, precision control is a huge priority. 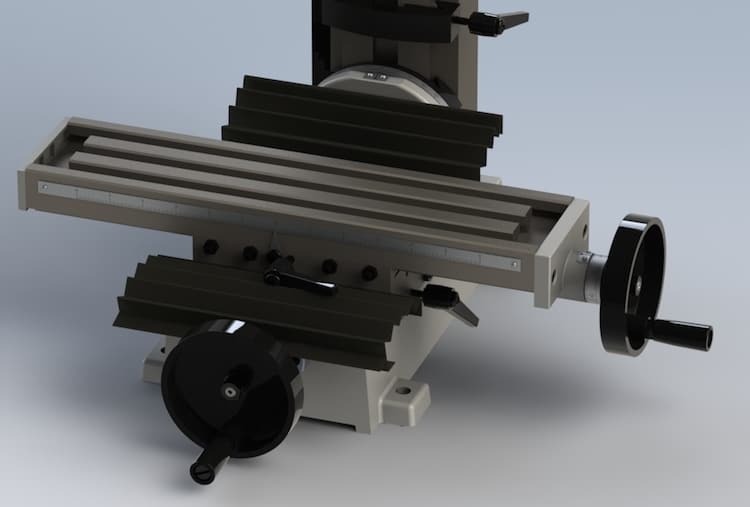 The x-axis wheel that adjusts the table can move at 0.100 inch per complete revolution, for ultra fine adjustments.Another handwheel located on the front of the table base is used to adjust the Y-axis, and works the same way as the longitudinal feed for precise front-to-back adjustments.A fully geared lift system is used to raise and lower the head up to 14-3/4 inches, (the head also has the ability to tilt up to 90 degrees on the horizontal axis).A great addition is the very clear digital read out and control panel. Tracking the spindle speed is also nice and simple via a back-lit digital spindle tachometer.Other features include a front-mounted emergency stop button, a transparent chip guard complete with safety switch.Shop Fox have also kitted the machine out with an innovative quick-reversing tapping mode to aid the creation of threaded holes. Overall Shop Fox have released a good, quality mill machine for the home workshop. It stands up well under its own terms, with some lovely features such as the clear digital display and control panel.However, when compared to the Jet which is in a similar price range, the Shop Fox does fall short on power and versatility. The Proxxon 34108 is another worthy addition to our top 5 best mini mill review list.The machine has some great functionality considering its size, providing the operator with an accurate milling system and drill for a wide range of materails.Countersink steel, cast iron, aluminum, brass and plastic can all be used with the Proxxon.Power comes in the form of a magnet motor via a poly-v-belt. The end result is a nice level of torque especially when operating at lower speeds. (The variable speed adjustment on the Proxxon ff230 offers 6 individual speeds. These are: 280, 550, 870, 1,250, 1,700 and 2,500-Rpm).Like our top pick Jet, the FF230 has a headstock that has the ability to spin through 360 degrees. (The quill and headstock can also be locked in to position, which is essential for accurate milling).A zero adjustable hand wheel adjusts the head height, and this can also be used as a fine feed when milling. (Precision control level is good too: one revolution equals 1/32″ (1 mm) travel, while 1 division equals .002″ (0,05 mm). 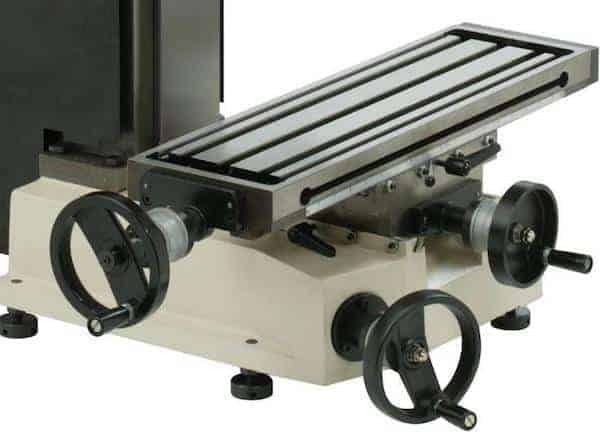 )The sturdy milling table while not the biggest in our top 5 still has a satisfying size, measuring 10 5/8 inches by 3 5/32 inches (270 x 80 mm).Total height of the machine comes in at 20-Inches and weight is 41-Pounds. Overall the unit is small and compact enough for a good home workshop, while being sturdy enough to handle a number of materials and tasks. Note: The clamps and work piece shown in the images are not included. The Proxxon 34108 micro mill is a nice machine with some great features and a satisfying level of build quality.Including the 360 degree head rotation is a real plus point. However, considering the mill is in a similar price range to the Grizzly, in our opinion you would be better placed to opt for the G0704 if this is your target budget. General features include a forward and reverse operation, safety shut off switch and adjustable depth stop. The machine ships with a 6-piece 4 Flute with 3/8″ Shank cutter set.The set includes 1/8″, 3/16″, 1/4″, 5/16″, 3/8″ and 5/32″ size cutters.Other vital specifications include a drilling & end mill capacity of 3/8 inches with a face mill capacity of 5/8 inches.The chuck capacity on the mill machine is 1/16″-3/8 inches. Accessories included to minimise extra spend after the machine is purchased, (although a clamping kit will be required). Doesn’t have the features or build quality of other mills in our list. A very worthwhile option for those on a budget, this mini mill machine will get the smaller jobs done.For those looking to the long term, and may need a machine with more power down the line, this may not be the best option for you. Because a range of tools can be classed as milling machines, it is important to clarify exactly what we are talking about when we say ‘Mini Mill’. The mini mills reviewed in this article can be classed as engineering mills. They are ideal for smaller workshops (they are freestanding or benchtop in configuration) and are designed to make or modify components from metal, wood and modern composites. Mini mill costs vary too. 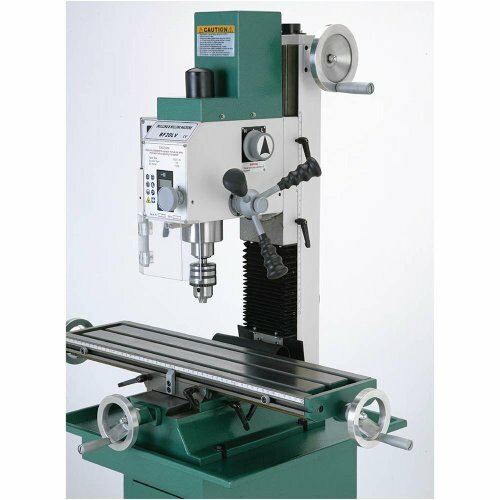 At the lower budget end you can find small drilling / milling machines available for under $1,000. However, accuracy and features are often compromised at this price range. The mid range and above priced mini mills (between $2,000 and $5,000) would not look out of place in a professional machine shop, and provide excellent power, features and accuracy for the hobbyist and home engineer. In this article we have excluded the top-end equipment. For a fully-fledged milling machine it is easy to spend upwards of $20,000. However, for obvious reasons, these are better suited to full-time engineering shops, rather than home or semi-pro use. Before we head on to our top 5 best mini mill reviews, let’s clear up a few main points on how a milling machine works. First off, mill machines come is two main varieties: vertical and horizontal. Mini-mills are generally vertical in design. This means that the axis of the spindle (i.e the rotating shaft in which the cutting tools are housed) is vertical in orientation. One can picture a vertical mill much like a heavy-duty drill press that has a worktable beneath the spindle. This table can be moved side-to-side and front-to-back with extreme precision. Horizontal mills use a spindle that is horizontally aligned. However, due to the fact mini mills do not opt for this configuration, we will not discuss them further here. The mill spindle is mounted in precision bearings, within the head of the machine. An adaptor mates with the tapered socket of the spindle, while holding the end-mill tightly in place. This setup is centred accurately onto the spindle axis. The important factor here is the precision control allowed by the user. A good mini-mill will allow for coarse and fine movement control of the head over the vertical axis. Once the operator has have found the desired position it is locked in place in preparation for the cut. The more control you have, the better the finished results. The mill table is mounted below the spindle while being precisely perpendicular to it. The ability to manipulate the table position with precision is just as important as being able to move the head accurately. The mini mill allows the operator to move the table front-to-back and left/right relative to the base of the mill. On a good mini-mill, sturdy hand-wheels will control this movement up to a precision of .001 inch on either axis. You should also look for a table that is ground to form a flat and even surface, while also containing slots. This allows for mounting bolts to be inserted so that work materials can be clamped into place. While the amount of horsepower a mini mill packs under the hood, will indicate the capabilities of the tool, you still need the machine to be of robust design to be able to handle tougher / larger materials. An obvious view point when buying a mini mill, is to opt for the most powerful model you can afford. This will help ensure you and your demands do not outstrip the capability of the machine. As far as construction goes, take care to ensure that the platform and table are as solid in design as possible. Torque is another important factor you should consider when buying the best mini mill. The more torque and down force your machine can muster, the better. This is normally obtained through buying a model with variable speed application. Multiple pully belt drive options will also allow you to adjust the ratio in order to impact the output rpms. Beyond the HP specification, you might also want to consider a few other variables too. When searching for the best mini mill for you, take a look a the overall speed range, the worktable surface area, the depth the spindle is able to travel along with the distance between the head and the table. Generally speaking, the higher the number, the more capable the machine will be. Mini mill manufactures will add different features depending on the price point they are trying to reach. While your budget will impact the amount of extra features you should expect to have, design additions such belt-free speed control, coolant pumps to keep everything working at the right temperature, powered assisted tables for easier manipulation, as well as simple add ons such as built in lighting, all amount to a machine that will be more enjoyable to use. Finally we have the variable of price. At the end of the day, how deep is your wallet, and how much are you willing to invest? If you are in the market for a top grade mini mill that will provide years of accurate production, you will naturally have to spend more. 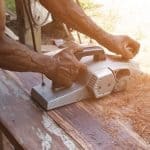 If you require only a simple mini-mill for occasional work, you may be able to opt for a lower priced model. However the trade off in accuracy, can sometimes make the costs saving redundant. The quality of the work is compromised as a result. The simplest rule of the thumb is to go for the best mini mill you can afford. 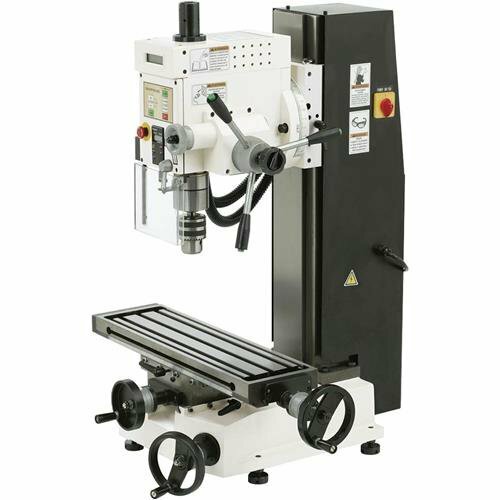 The Jet JMD-18 350018 gets our top pick milling machine because of the balance of high performance, excellent control and overall affordability. The design of the machine allows the operator to work on bigger jobs, without the necessary outlay you would normally have to conduct on a fully fledged professional engineering mill. Under the hood, Jet have opted for a robust and powerful 2 horsepower, 230-volt motor working on a 1 phase system. A huge plus point is the sheer range of the variable speeds the machine can operate on. A total of 12 spindle speeds from 15 to 3,000 RPM are available. A hinged belt cover design encases the motor resulting in faster speed changing. To facilitate a wider range of possible applications, Jet have also provided an extra large, 9.5 x 31.75 inch work table. This extra space allows for larger scale projects over a standard sized mini mill. There’s been no scrimping on overall design quality or materials used either. The JMD-18 utilises a strong one-piece cast iron column structure, meaning heavier materials can be milled with this machine without undue stress occurring. Furthermore, heavy-duty, tapered roller bearings support the spindle. The end result is greater overall tolerance combined with increased accuracy and drilling depth. Precision control is what the Jet JMD-18 is all about. The machine is easy to operate because of its user-friendly features. Small touches such as the satin finished dials, the positive quick-stop knob and easy-to-read internal depth gauge, all allow for greater user control. The manufacturers have also built in a 360-degree swivelling head system. This provides even greater versatility while helping ensure you get the quality results you need. To make sure none of your work goes wayward through lack of visibility, the Jet also has a built in worklamp for added illumination when required. To top it all off, Jet have also backed the JMD-18 with a healthy two year warranty. 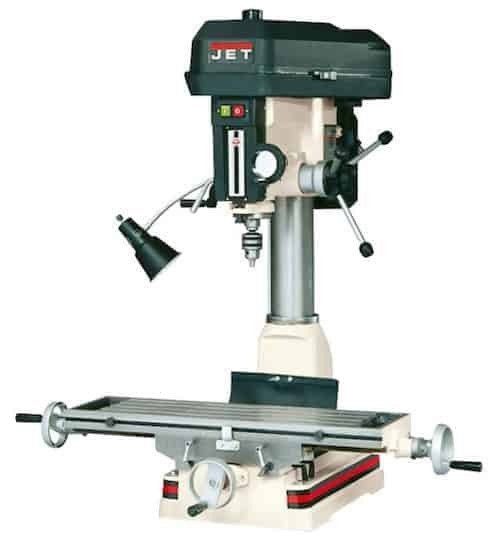 The Jet JMD-18 is a top notch milling machine priced to appeal to home hobbyists and semi pro enginners. The features, the power and the accuracy make for an excellent machine that will last you for many years to come. In our opinion, it is the best mini mill on the market today. 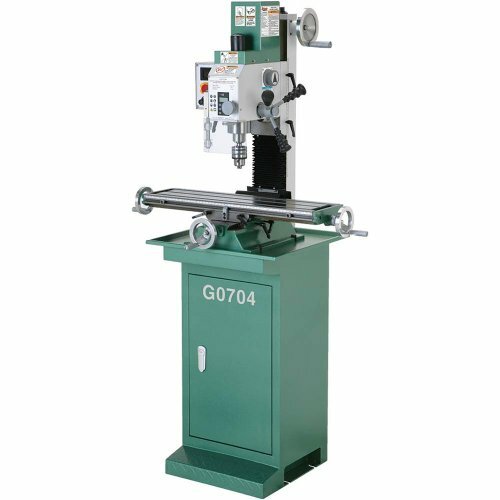 The Grizzly G0704 is another great mill machine that has a deserving place in our top 5 round up. The ever reliable Grizzly have managed to pack in some excellent features, some of which you would expect to find on a lot larger and higher priced mills. As a lower priced option when compared to the top pick Jet, the motor is less powerful in comparison. The G0704 offers a 1 HP, 110V, 12A, (single-phase) motor under the hood, with a variable Spindle Speed of 50–2250 RPM. A great feature that you would not expect on a mill within the price range is the R8 spindle with digital read out. This really does amount to greater control with all important ease. Grizzly have designed the unit to offer 2 feet of spindle travel along with a maximum 11 feet head travel. Furthermore, the head has the ability to tilt 90 degrees left/right. Table space is adequate too, with dimensions coming in at 7-1/16 inches x 26-5/8 inches. Built using a precision-ground cast iron construction the unit is very robust indeed. Other features include a safety shut off switch, forward/reverse switch, fine feed head control and a 2-speed gearbox. To top it all off, Grizzly throw in the very sturdy stand as shown in the pictures. 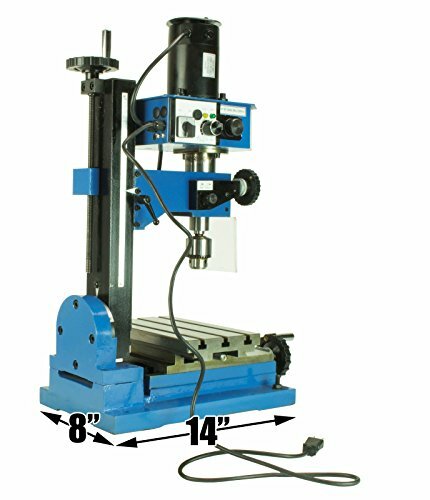 (Total stand footprint is 15-3/4″ x 16-1/2″, foor-to-table height: 37-1/2″ – ideal for the home workshop). The Shop Fox M1111 is a great tool that offers a lot of functionality all in one package. The manufacturers have opted for a 1hp 220v (110v operation) brushless DC motor alongside a range of technical features to make your milling work as painless as possible. Let’s take a closer look at what you are getting for your money. The 1-horsepower motor features a push-button speed control that deliver variable speeds between 100 and 1,750 revolutions per minute (RPM). While not the same range as the Jet or the Grizzly, many will find this adequate speed control overall. The 6-1/4 inches x 21-5/8 inches surface ground milling table has been precision-ground from cast iron. 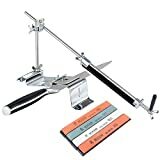 Travel range is good at 5-3/4 by 15-1/2 inches, and is operated by a hand wheel. As you would expect, precision control is a huge priority. 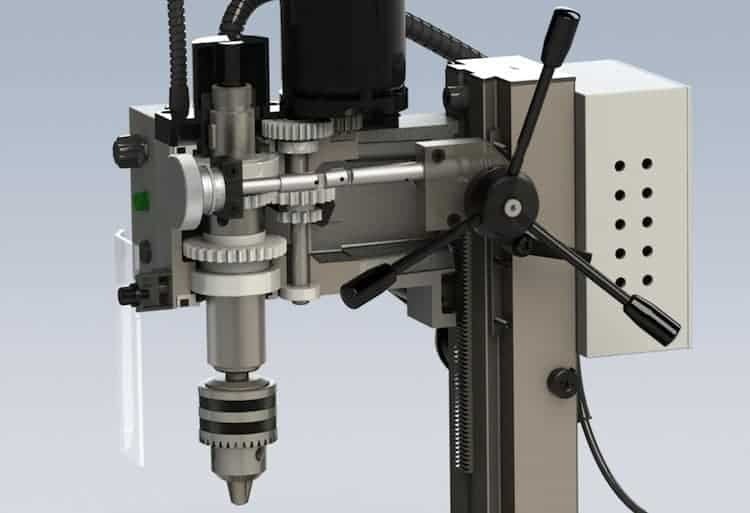 The x-axis wheel that adjusts the table can move at 0.100 inch per complete revolution, for ultra fine adjustments. Another handwheel located on the front of the table base is used to adjust the Y-axis, and works the same way as the longitudinal feed for precise front-to-back adjustments. A fully geared lift system is used to raise and lower the head up to 14-3/4 inches, (the head also has the ability to tilt up to 90 degrees on the horizontal axis). A great addition is the very clear digital read out and control panel. Tracking the spindle speed is also nice and simple via a back-lit digital spindle tachometer. Other features include a front-mounted emergency stop button, a transparent chip guard complete with safety switch. 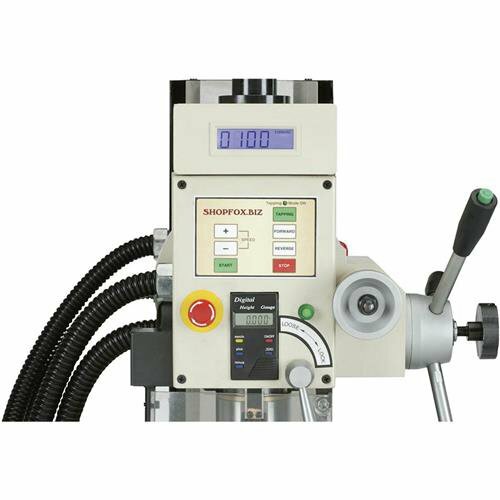 Shop Fox have also kitted the machine out with an innovative quick-reversing tapping mode to aid the creation of threaded holes. Overall Shop Fox have released a good, quality mill machine for the home workshop. It stands up well under its own terms, with some lovely features such as the clear digital display and control panel. However, when compared to the Jet which is in a similar price range, the Shop Fox does fall short on power and versatility. The Proxxon 34108 is another worthy addition to our top 5 best mini mill review list. The machine has some great functionality considering its size, providing the operator with an accurate milling system and drill for a wide range of materails. Countersink steel, cast iron, aluminum, brass and plastic can all be used with the Proxxon. Power comes in the form of a magnet motor via a poly-v-belt. The end result is a nice level of torque especially when operating at lower speeds. (The variable speed adjustment on the Proxxon ff230 offers 6 individual speeds. These are: 280, 550, 870, 1,250, 1,700 and 2,500-Rpm). Like our top pick Jet, the FF230 has a headstock that has the ability to spin through 360 degrees. (The quill and headstock can also be locked in to position, which is essential for accurate milling). 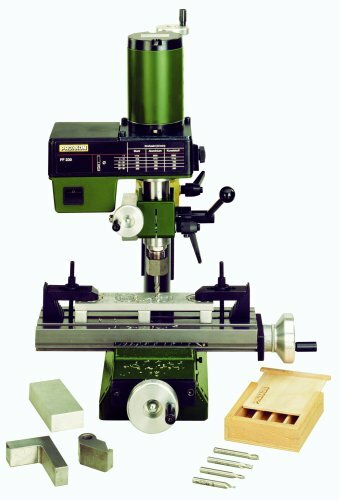 The sturdy milling table while not the biggest in our top 5 still has a satisfying size, measuring 10 5/8 inches by 3 5/32 inches (270 x 80 mm). Total height of the machine comes in at 20-Inches and weight is 41-Pounds. Overall the unit is small and compact enough for a good home workshop, while being sturdy enough to handle a number of materials and tasks. Note: The clamps and work piece shown in the images are not included. The Proxxon 34108 micro mill is a nice machine with some great features and a satisfying level of build quality. Including the 360 degree head rotation is a real plus point. However, considering the mill is in a similar price range to the Grizzly, in our opinion you would be better placed to opt for the G0704 if this is your target budget. Finally, the most budget conscious pick in our top 5 list currently retailing at the high 3 figure dollar mark, this machine is great for those that only need do small milling jobs and do not want to spend too much. The variable mini milling and drilling bench top machine has two speed settings, low: 0 – 1000 RPM and high: 0 – 2000 RPM, (all powered by a 150W motor). General features include a forward and reverse operation, safety shut off switch and adjustable depth stop. The machine ships with a 6-piece 4 Flute with 3/8″ Shank cutter set. The set includes 1/8″, 3/16″, 1/4″, 5/16″, 3/8″ and 5/32″ size cutters. Other vital specifications include a drilling & end mill capacity of 3/8 inches with a face mill capacity of 5/8 inches. The chuck capacity on the mill machine is 1/16″-3/8 inches. A very worthwhile option for those on a budget, this mini mill machine will get the smaller jobs done. For those looking to the long term, and may need a machine with more power down the line, this may not be the best option for you.